Arthritis— which literally means “inflamed joint” — can affect any joint in the body, including the joints between the 29 bones of the wrist, hand, and fingers. Arthritis of the hand can hurt and keep you from being able to do what you want or need to do. The most common forms of arthritis in the hand are osteoarthritis, post-traumatic arthritis (after an injury), and rheumatoid arthritis. Osteoarthritis is a degenerative joint disease in which the smooth cartilage that covers the bone surfaces at the joints either is injured or wears over time. Do I Need Carpal Tunnel Surgery? https://orthosportsmed.com/wp-content/uploads/2018/06/Do-I-Need-Carpal-Tunnel-Surgery.jpg 320 845 orthosportsmed https://orthosportsmed.com/wp-content/uploads/2015/01/osm-header-vs7.png orthosportsmed2018-06-13 07:16:572018-06-13 07:48:39Do I Need Carpal Tunnel Surgery? What Is Psoriatic Arthritis & How Do You Treat It? Arthritis describes any condition where cartilage in the joint breaks down. Normally, a joint consists of two smooth, cartilage-covered bone surfaces that fit together as a matched set and glide against one other. Arthritis can result when these smooth surfaces become irregular as the cartilage breaks down. This results in surfaces that don’t fit well together anymore, essentially “wearing out. Psoriatic arthritis is a condition in which the lining of the joint gets inflamed and swollen. Because this inflammation stretches the tissues that keep the joint strong, the joint may become loose or crooked. Also, the smooth ends of the bones wear out, and the bone may lose its normal shape. Psoriatic arthritis can affect any joint in the body, and it affects men and women equally. 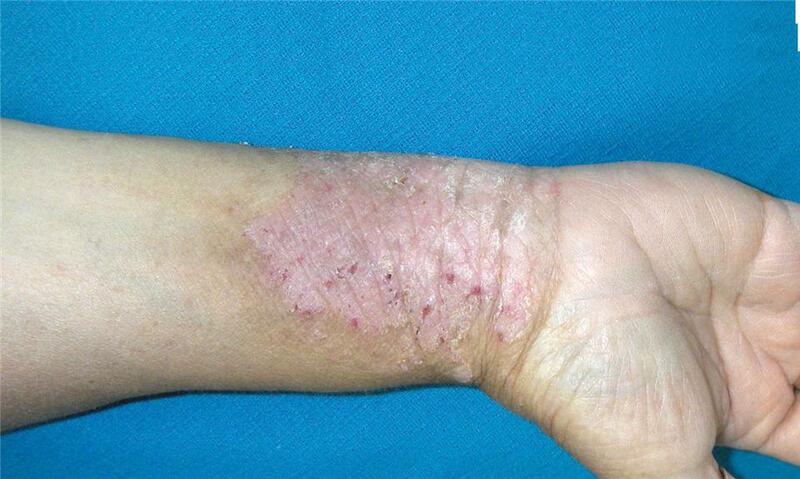 Psoriasis is a skin condition where people’s skin becomes dry, red, and flaky (Figure 1). It can affect any part of the body. Up to 30% of people with psoriasis develop psoriatic arthritis, according to the National Psoriasis Foundation. Arthritis can be debilitating when it affects the hands and fingers. The most common forms of arthritis in the hand are osteoarthritis, post-traumatic arthritis (after an injury), and rheumatoid arthritis. Other causes of arthritis of the hand are infections, gout, and psoriasis. 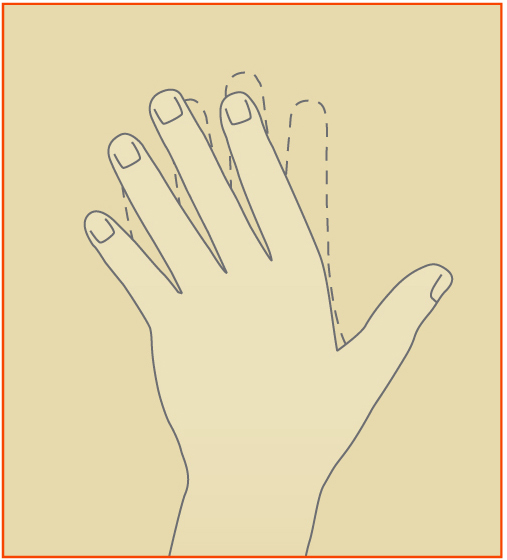 With this condition, the hands may not be affected equally. It may be hard to tell psoriatic arthritis from other types of arthritis because most types of arthritis have symptoms of stiffness, swelling, and pain. 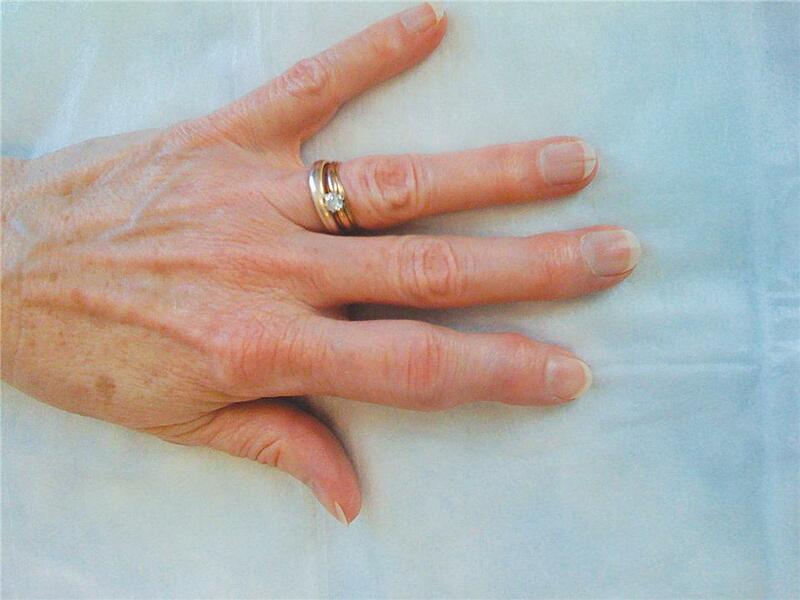 In psoriatic arthritis, the swelling often affects the whole finger but more at the middle joint (figure 2). There may be pitting, ridging or crumbling of the fingernails. 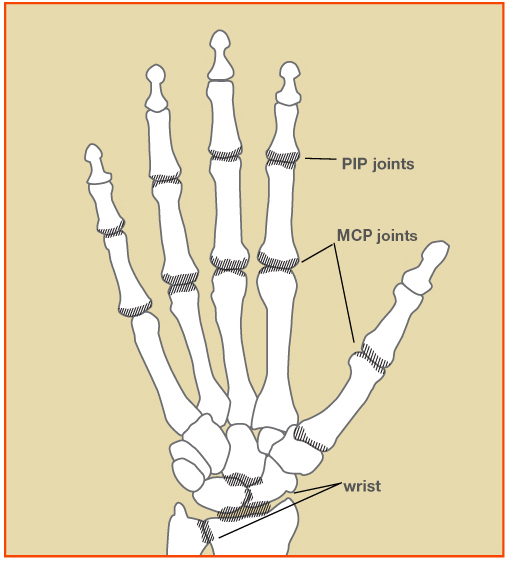 The joint at the end of the finger may become deformed (figure 3). Other parts of the hand and wrist are not usually affected. Psoriatic arthritis is suspected when people have psoriasis and develop problems with their joints. The doctor will mainly look at and feel the hand and look at x-rays. X-rays may show loss of the normal shape of the bone, mainly at the end joint. X-rays may also show swelling around the bone, and the space between the bones may become narrow. The bones may fuse together at a joint. There is no special blood test to find out if one has this arthritis. A piece of skin can be removed to help find out if a person has psoriasis. There is no cure for psoriatic arthritis, but there are medications available to help lessen swelling, redness, and pain to keep the hands functioning as well as possible. Different medical specialists usually work together to help with the treatment of this arthritis, including physicians and therapists. Surgery may help treat the problems of psoriatic arthritis. The type of surgery needed depends on the problems one has with use and pain. A hand surgeon will help guide you to the best treatment for your particular concerns. https://orthosportsmed.com/wp-content/uploads/2018/05/Psoriatic-Arthritis.jpg 350 850 orthosportsmed https://orthosportsmed.com/wp-content/uploads/2015/01/osm-header-vs7.png orthosportsmed2018-05-31 09:47:522018-05-31 09:47:52What Is Psoriatic Arthritis & How Do You Treat It? Shoulder fractures can result from a fall on the shoulder, a motor vehicle accident, contact sports, etc. The shoulder is a complex joint connecting the arm to the body. The shoulder bones include the humerus (upper arm bone), the scapula (shoulder blade) and the clavicle (collarbone) (Figure 1). 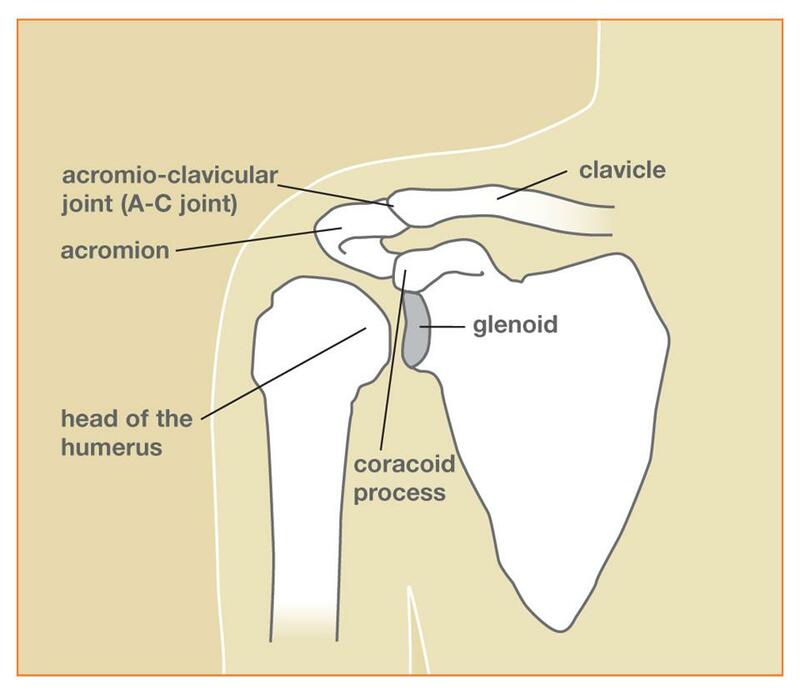 The upper end of the humerus has a ball-like shape that connects with the socket of the scapula, called the glenoid. Disruption of any of the parts of the shoulder can create difficulty with its function. 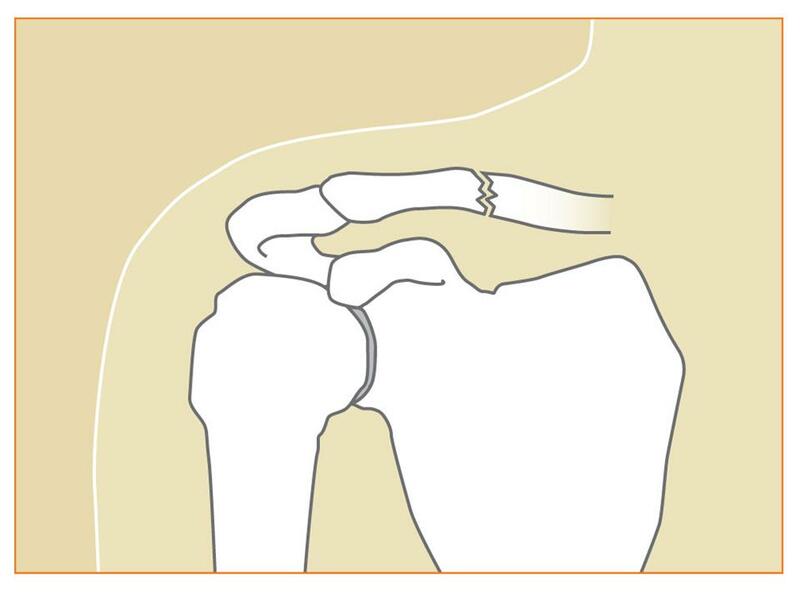 Clavicle Fractures: This is the most common shoulder fracture, frequently the result of a fall (Figure 2). Scapula Fractures: Fractures of this bone rarely occur. They usually result from high-energy trauma such as motor vehicle accidents or a far fall. Proximal Humerus Fractures: Fractures of the upper part of the arm are more common in the older (over 65 years of age) population. Sometimes, there are just cracks in the bones, but they have not moved very far out of their normal position. Some fractures are diagnosed using x-rays. Sometimes, a CT scan is needed to see more detail. Simple sling or “figure 8” strap worn for three to eight weeks, depending on the patient’s pain. 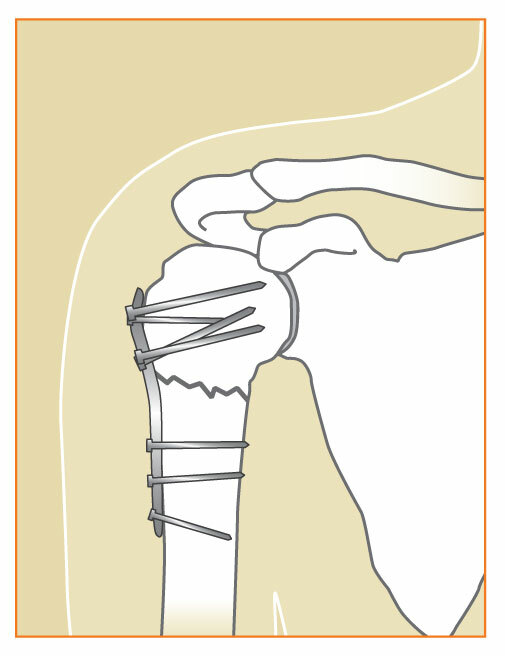 Surgery, which may include placing plates and screws or wires and sutures (Figure 3). This is more often needed when there is injury to the glenoid (shoulder socket) or when broken bone pieces are severely out of place. Once healed, there may be a bump over the fracture site which may decrease with time, but sometimes a bump will remain permanently. Shoulder movement can begin as soon as pain goes away; return to sports cannot occur until full shoulder strength returns. Return to contact sports would be considered only when the fracture is fully healed as shown on an x-ray. Selection of treatment depends upon the patient’s activity level, the location of the fracture and the severity of the fracture. Shoulder fractures may leave a patient with permanent shoulder stiffness, regardless of how well the bones were repaired or joint replacement performed. Recovery may require the use of physical therapy to assist in improving motion and strength. Consult your physician for the best option. Dr. Petit gave lectures on complex shoulder replacement (arthroplasty) along with shoulder arthroscopy and biceps tenodesis to the international audience. Attendees included shoulder surgeons from around the world as well as physical therapists, athletic trainers, and primary care providers. Top shoulder surgeons from around the world making presentations during Summit at Sonnenalp Vail April 6th and 7th. VAIL, Colo., April 6, 2018 – The latest and most up-to- date methods and technologies in shoulder surgery will be the primary topics of discussion at the Vail International Shoulder Summit on April 6th and 7th at the Sonnenalp Hotel in Vail. The Summit is sponsored by Steadman Philippon Research Institute (SPRI), with The Steadman Clinic’s own Peter Millett, MD, MSc serving as the primary host of the event. The two-day session begins today, Friday, April 6th with SPRI clinical fellowship and International scholar alumni attending. The Summit continues Saturday the 7 th and is open to all orthopaedic surgeons, athletic trainers, physical therapists and professionals in orthopaedics and sports medicine. Dr. Millett – who is a shoulder, knee and elbow specialist at The Steadman Clinic and has practiced sports medicine there since 2005 – looks forward to the variety of topics that will be discussed at the weekend’s Summit. While Millett and SPRI have played host to numerous national and international conferences over the years that have focused on shoulder surgery and injuries related to the shoulder, this marks just the second time that they have included a day solely for returning alumni. “Since so many of us know each other so well,” continued Millett, “it creates more openness and frank dialogue. This format allows us to be less reserved, more candid, and therefore more likely to get real advancements. It leads to some great discussion and helps us all learn more about the latest innovations in shoulder care. The Shoulder Summit begins Friday with presentations on the AC joint, bicep tendon, shoulder instability and rotator cuff tears. Saturday’s agenda includes segments on shoulder joint preservation and shoulder arthroplasty (total shoulder replacement surgery). In addition to Millett, Burak Altintas, MD and Robert Boykin, MD will be serving as course directors for this year’s Shoulder Summit. Altintas, a German orthopaedic surgeon—originally from Turkey—is currently serving as an International scholar at SPRI, working closely with Millett and specializing in shoulder injuries and surgery. Boykin, who trained at Harvard, is a former sports medicine fellow at The Steadman Clinic and now practices as an orthopaedic surgeon in Asheville, N.C.
Other key presenters include The Steadman Clinic and SPRI’s own Matthew Provencher, MD and Johnny Huard, PhD. Provencher—a shoulder, knee and sports surgeon at The Steadman Clinic—will concentrate his talks on shoulder instability. Huard—Chief Scientific Officer and Director of the Center for Regenerative Sports Medicine at SPRI and recently named a recipient of the prestigious 2018 ORS (Orthopaedic Research Society) Kappa Delta Award—will talk about the use of biologics in the shoulder during Saturday morning’s discussion on shoulder preservation. Will I Need Surgery on My Broken Or Fractured Finger? You may begin using your hand again as soon as your doctor determines it is okay to move your finger. Doing simple rehabilitation exercises each day will help reduce the finger’s stiffness and swelling. You may be required to see a physical therapist to assist you in these exercises. https://orthosportsmed.com/wp-content/uploads/2018/04/How-To-Treat-Finger-Fractures.jpg 320 845 orthosportsmed https://orthosportsmed.com/wp-content/uploads/2015/01/osm-header-vs7.png orthosportsmed2018-04-25 03:22:302018-05-31 09:39:50Will I Need Surgery on My Broken Or Fractured Finger?